iMessage, an instant messaging service designed by Apple, benefits a lot iOS users by facilitating to deliver pictures, videos, voice messages together with text messages. Sometimes, iMessages that seems unnecessary at present but important at a later time may be deleted, like Noreen. 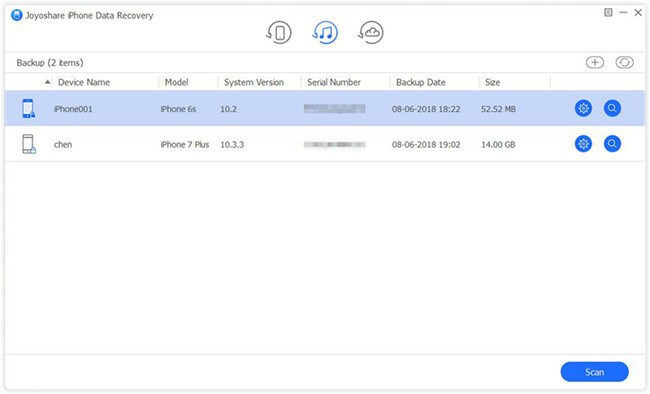 Nevertheless, chance can be given to recover deleted iMessages on iPhone 7 on condition that lost files are not overwritten by new data. Next we will pay attention to show you in-depth steps. Being fully compatible with iOS 12 and the latest iOS devices, like iPhone XS/XS Max/XR/X, Joyoshare iPhone Data Recovery can be regarded as one of the most powerful tool to recover lost or deleted iMessages from any iDevice, iPhone 7 included. It is committed to finding up to 20+ iOS data types either from iTunes/iCloud backups or from iPad/iPhone/iPod touch. 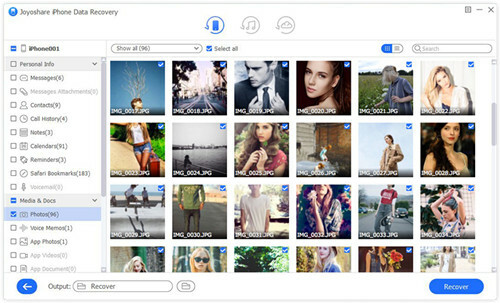 Apart from iMessages, this strikingly amazing iOS data recovery tool also has capability to retrieve files, such as photos, videos, notes, reminders, call history, contacts, Safari bookmarks, WhatsApp/Kik/Viber data, etc. in a secure way. It is able to preview scanned recoverable contents in real time and selectively mark specific items flexibly. Additionally, it gives access to filter out needless files as you wish, without costing too much time to choose target data one after another. As is often the case, no backup will be made in advance if you think the probability of data loss is low, which, however, not meaning there is no way allowed to find important deleted iMessages. Now we will focus on introducing how to straightly recover iMessages from iPhone 7. 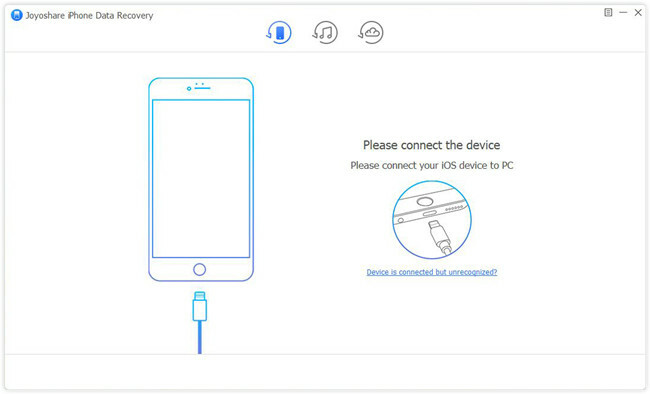 In order to get iMessages back from iPhone 7 device, you should connect it with your computer by using an original USB cable under "Recover from iDevice" mode on Joyoshare iPhone Data Recovery. Soon after, Joyoshare will show recognized iPhone 7 device info on the left side and display data types on the right. By default, all data will be checked for later scan. You can unmark them in the way you like and only tick "Messages & Attachments". Then continue to click "Scan" button at the right bottom. 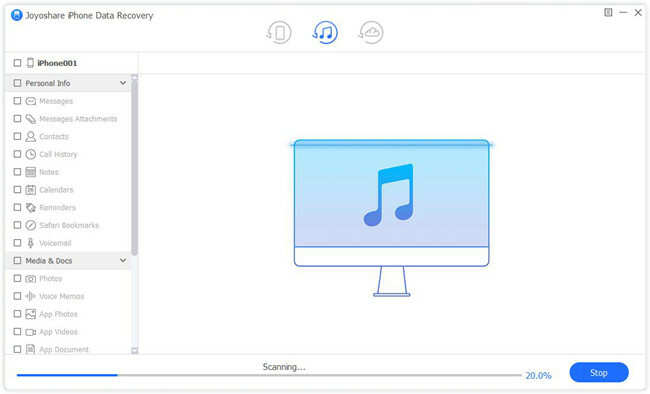 Once the scanning process ends, you can go forward to preview results one by one, viewing or playing them in real time. Data files you need should be classified into "Messages" and "Messages Attachments". Pick up desired items and simply press "Recover" button to export them. Anyone who has regularly synchronized iPhone data to iTunes or iCloud can get more possible opportunities to get deleted/lost iMessages back compared to people who don't have backups. 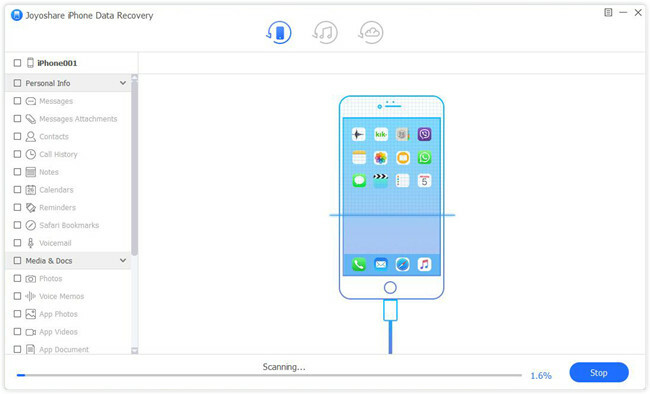 As long as you draw support from Joyoshare iPhone Data Recovery, there is no risk to lose, damage or overwrite your iPhone's current existing files. Next let's take iTunes backup as an example to show guide (Recovering from iCloud using Joyoshare is similar to recover from iTunes). Get Joyoshare iPhone Data Recovery run and head to the top menu to switch recovery mode to "Recover from iTunes". Joyoshare will detect and sync all previous iTunes backups in a list with device model, backup date, size, etc. presented in details. Select the most relevant one and hit the "gear" icon behind it to confirm data types. Likewise, make "Messages & Attachments" chosen and tap on "Scan" button. It will take you a while to finish scanning files saved on created iTunes backup. Afterwards, you are allowed to enter different categories to look through all found contents. Mark iMessages that you would like to recover and simple click "Recover" button to output them to computer locally. 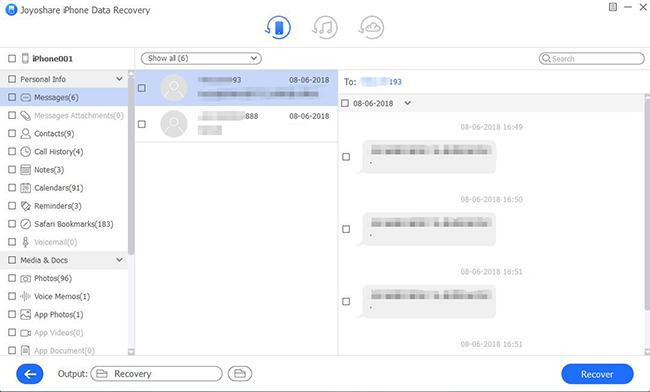 In case you wonder how to get your deleted iMessages off iCloud backups in a clear way, you can specifically see also: Recover iMessages from iCloud here.